The Phury Humbucker by Dragonfire is a passive pickup offering a moderate wind and alnico magnet style along with premium adjustability. With slightly scooped mids, the Phury Buckers excel in 80’s, rock, classic rock and old-school metal genres but are also great for open tone with treble and bass in other styles. If you want your guitar to scream like a demon in both clean and dirty playing genres, the Phuries are the way to go. These dynamic pickups showcase 1 row of hex-screw style polepieces and 1 row of regulating screw style polepieces so all 12 polepieces are adjustable for optimal sound versatility. These allow you to personalize your playing style and take it to the next level while standing out. 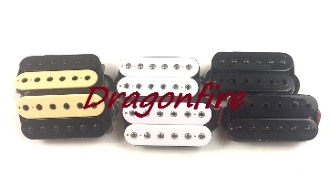 The alnico magnets featured in these pickups provide warm, smooth tone for less harsh and more cream in your playing.